You are here: Home › Welcome to Camera Ready U! › Notify Me! Just sign up below for the Camera Ready U notification list, where we’ll let you know the instant we have new content for you. We will never sell or share your information. 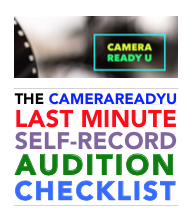 When you confirm, you’ll also get a free copy of my CameraReadyU Last Minute Self-Record Audition Checklist!